Obviously, a lot of people will want Crypteks with Eldritch Lances. I think this is the easier way to convert them. Just chop up a dark lance (so many of them around these days with the plethora of Dark Eldar players) and stick it on the end of his staff. However these guys are expensive to buy. Four of them will set you back almost 40 pounds and that's a lot of money for a few models. I think that the best way to kitbash them is from the Immortal kit. Just use the Deathmark head and a combination of the two spines. The little "hat" can be made very easily with a little plastic card (same with his "skirt") and the arms look like they can be repositioned very easily with a bit of chopping. Then used a plastic rod and the Dark Lance as the example above. I think I will give it a go? So what ideas do you guys have for cheaper Crypteks? You think that convertion will work? Let me know what you think. Games Workshop website, Tuesday 22nd November. Do go and have a look. Matt Ward did a converted Cryptek and its picture is near the bottom of the page. 1) Harbingers of Storm: Lightning pattern. 2) Harbingers of Time: Paint numbers or symbols matrix style as if scrolling down. 3) Harbinger with Solar Pulse: Fire or starburst pattern. Not sure of the other two but you get the idea. 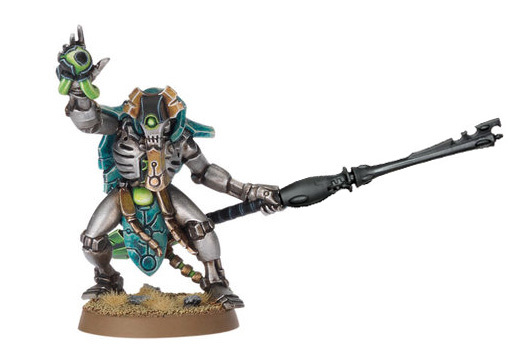 Think the dark lance looks wrong on a cryptek. Just my opinion however. Ah, very cool, he seems to have done what I had in mind but he used bits from the Praetorians. Problem is, if you buy Immortals + Praetorians you end up spending more monies than the 4 crypteks alone. No worries, I am just looking for people's opinions. I think that in the codex there is the underlying idea that all the newer races borrows stuff from Necron technology. So, for example, the Eldar probably found some Eldritch Lances in a tomb world and made them into their Bright Lances with some enhancments(that's why the two weapons have such similar profiles). With this in mind, it wouldn't be too odd to see the weapons being similar in appearance as well. I think the idea is that, it is actually a little cheaper and you can still build immortals as a bonus. you convert praetorians/lychguard into crypteks, using deathmark heads from the immortals kit. total: 80 for 10 models, gives you 5 crypteks and 5 immortals, and you can pose them how you see fit. 95 for 5 crypteks, with only one pose. It's cheaper, and more versitle, and you get more stuff! Lets say you want to max out the crypteks at ten. standard crypteks hit you for 190 and they all look the same, lol. Lychgaurd crypteks hit you for 160, you also get 10 immortals as a prize, and as an added bonus not of them have to look the same. trust me, you will use the immortals and you will likely want at least 5 crypteks. heck, even if you don't, it's still cheaper than just the crypteks. lol, they'd have to drop the price of crypteks to less than 8 bucks, just to make you not want to do this. oh, and they are plastic vs finecast, another positive. Yeah that's actually a good idea. Use the Praetorians bodies and bits from Immortals to make the crypteks so you'll have 5 Immortals left in the end. 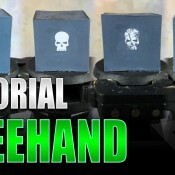 Gonna make some for a friend this way, he suggested this method too and see how it goes.